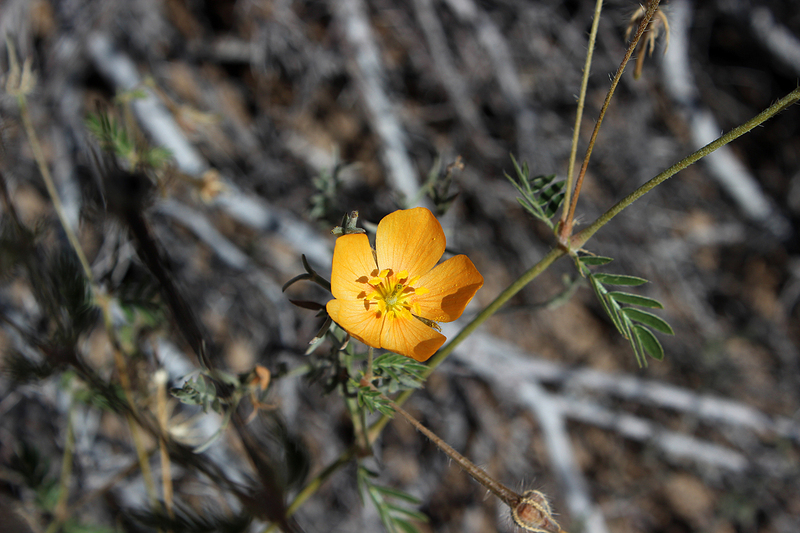 From Tuff Canyon, we followed the Ross Maxwell Scenic Drive to its terminus at the main park road. 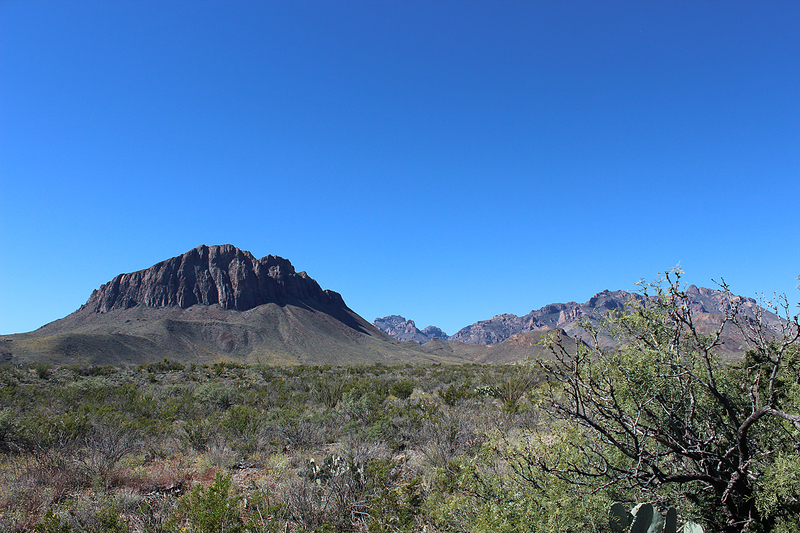 We headed east, north of the great bulk of the Chisos Mountains. We passed the park headquarters at Panther Junction and continued southeast, windows open to the glorious fragrances of a cloudless morning. 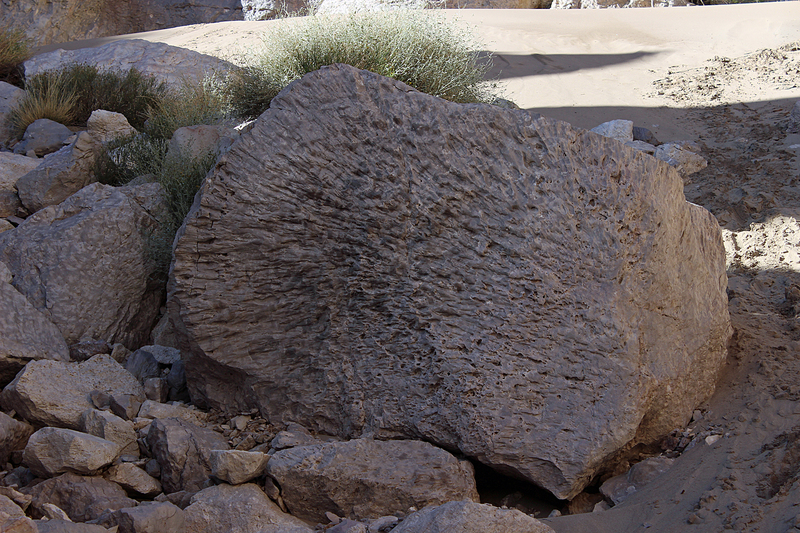 Although we were bypassing a host of sights we eventually wanted to linger at, it was Sunday and the only full day we’d be at the park when the crossing to the village of Boquillas del Carmen in Mexico would be open. So we were headed there for lunch. 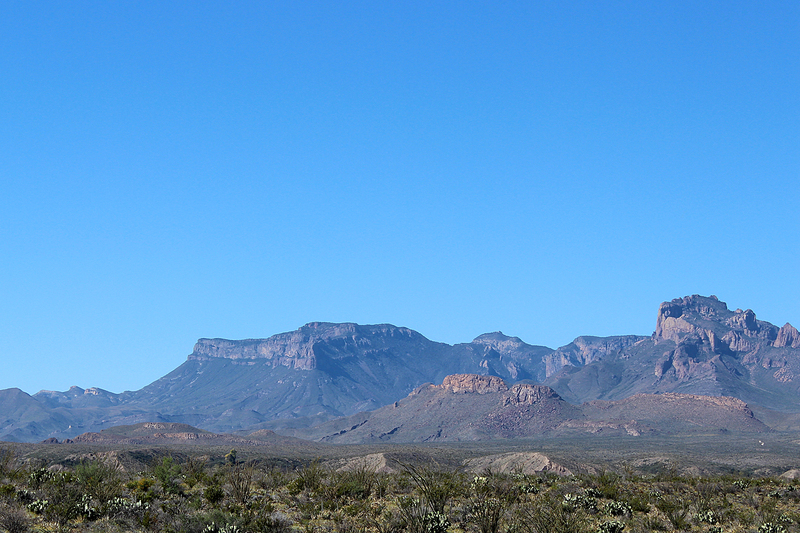 On the way, we rounded the Chisos, the heart of Big Bend. Driving along, windows open, suddenly an insect flew in, hit my leg, and landed on the floor of the car. All I’d seen was a flash of black and yellow. Unsure whether it was a bee or wasp or something else, I looked for the closest place to pull over. That happened to be Glenn Springs Road, a dirt road that wound from the park road toward the Chisos. 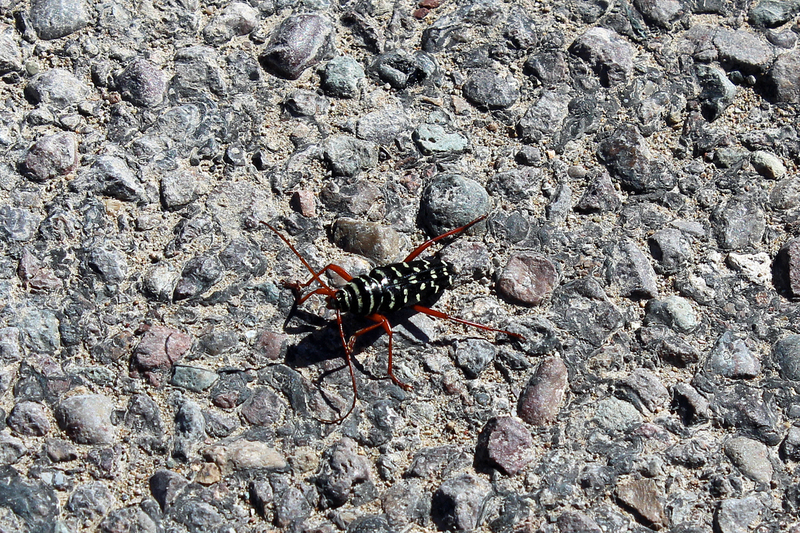 We got out of the Captiva, and I brushed the stunned insect, clearly not a bee, out of the car. 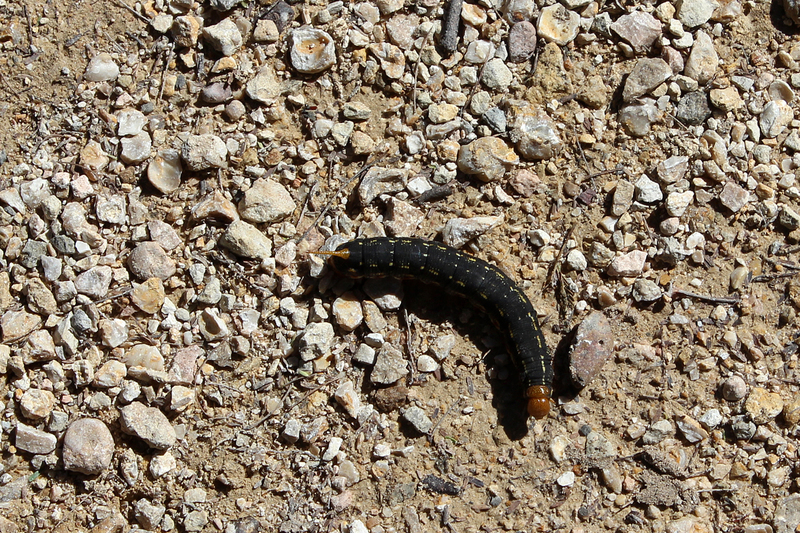 The insect was actually at type of beetle, the Mesquite Borer, handsome fellow. Sean surveyed the surroundings. 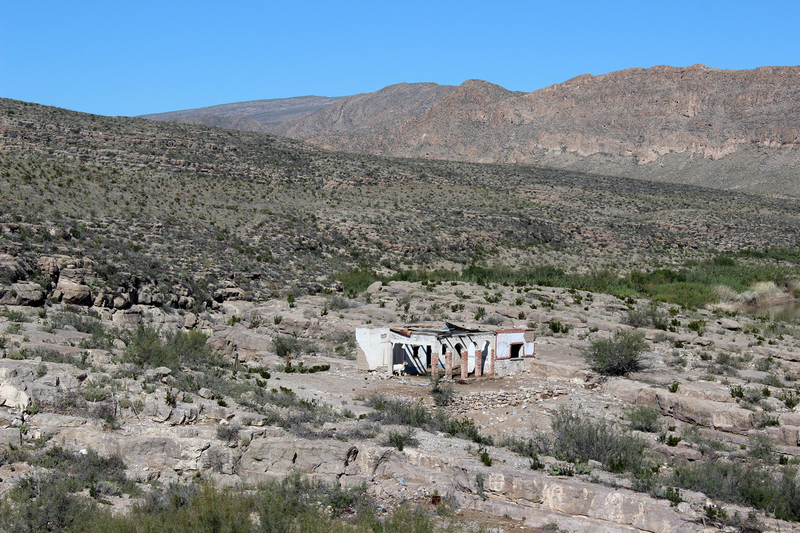 Our unexpected stop gave us an incredible view of the great vista of the Tornillo Basin, the huge depression that comprises the park between the cliffs of Santa Elena Canyon to the west and the Sierra del Carmen to the east. Unfortunately, there isn’t a photo we took that captures it. We’ll have to retain it in our memories. Ironic, for a project so bountiful in photography. 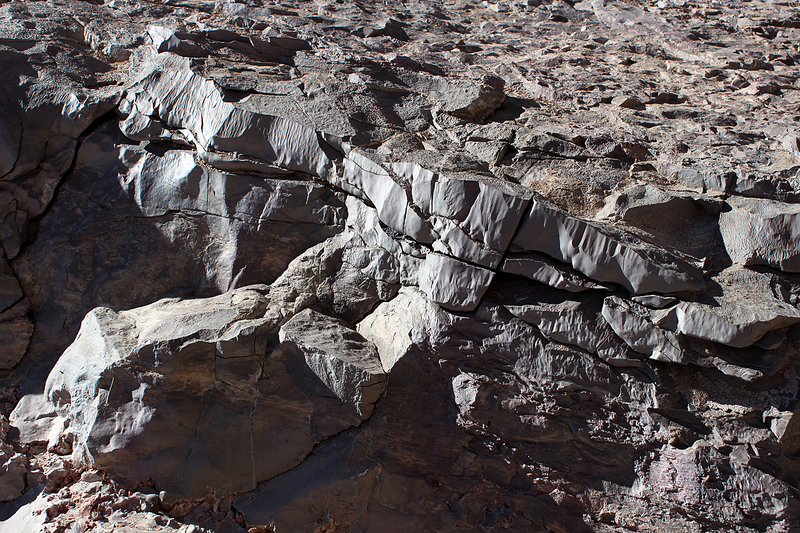 We continued on, 20 miles from the park headquarters and 53 miles from Santa Elena Canyon. 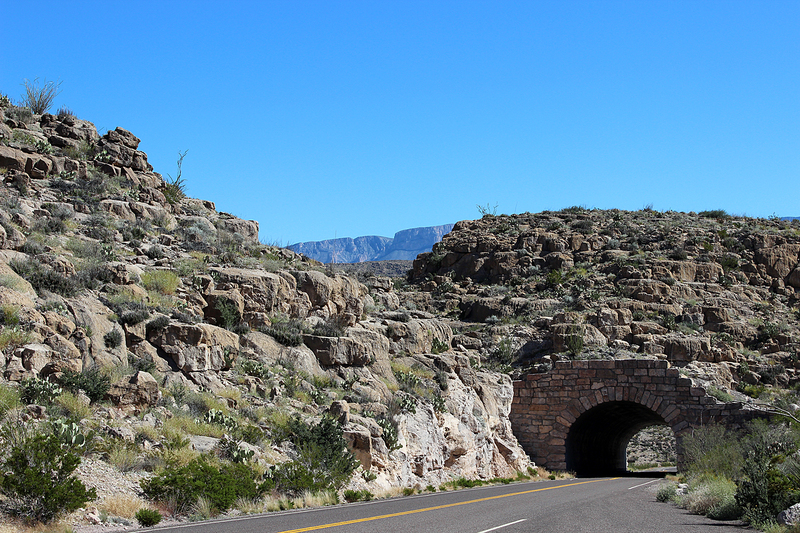 Eventually we reached a tunnel, beyond which the road dropped to Rio Grande Village, with its visitor center and large campground. 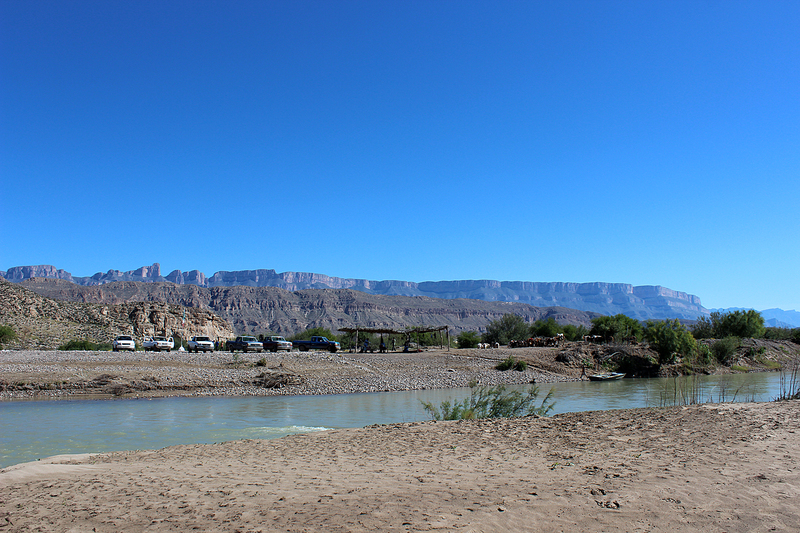 After gassing up and finally purchasing backpacker camp stove fuel, we drove east to the international border crossing to Boquillas del Carmen, Coahuila, Mexico. 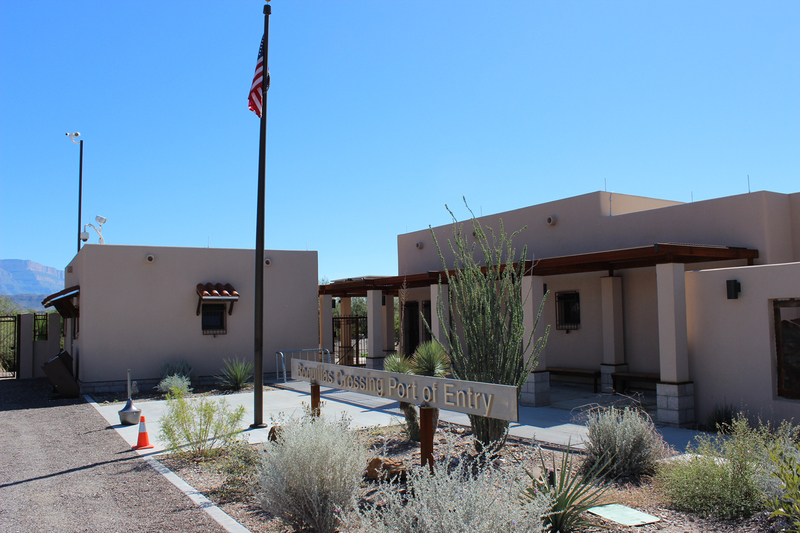 We parked, gathered our things, and walked into the port of entry building, where there were two extremely helpful park rangers to answer questions. We asked how it worked. One of the rangers explained that we were to walk down to the river and that someone would come across for us, that we pay the fare on the other side. Then once we were in the village, we’d have to go through Mexican customs. They cautioned us to be certain to be back across the river before 6pm, otherwise we’d be stuck in Mexico until Wednesday since the crossing was closed Mondays and Tuesdays. On the way down the lush path to the river, I was still somewhat nervous about how it would all work. We passed a couple headed back to the port of entry. They offered that we would love the experience, and that Vitor would sing to us. Intrigued, we continued toward the river. When we reached the river, the people on the other side waved. One man got into a rowboat while another, Vitor, began singing “O solo mio.” In a moment the boat was across the river and we had clambered onto it. The man asked if we spoke Spanish. Sean’s Spanish is fairly good, much better than mine, but between the traveling and the hiking and the exertion, neither of us was particularly fluent at the moment. Once we were across, we climbed the bank to a covered shelter where we paid for our $5 round-trip tickets. 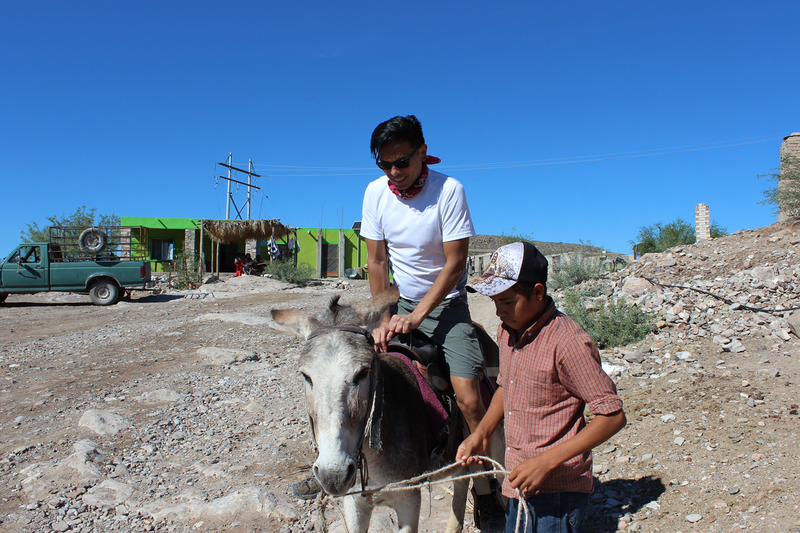 Then Vitor asked if we wanted to go the 3/4 of a mile up the hill and into the village via truck, horse, burro, or hiking. Sean said hiking, but I interrupted and said we’d go by burro. 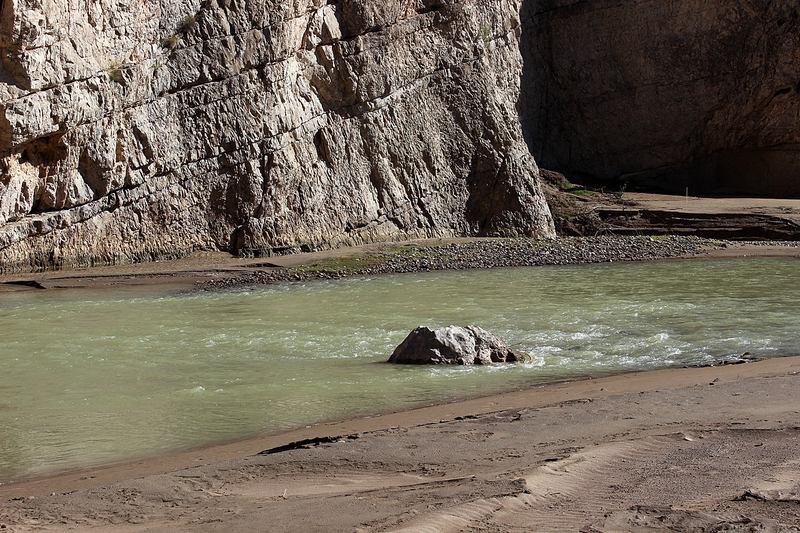 When would we ever again have the chance to cross the Rio Grande and ride a burro into town? 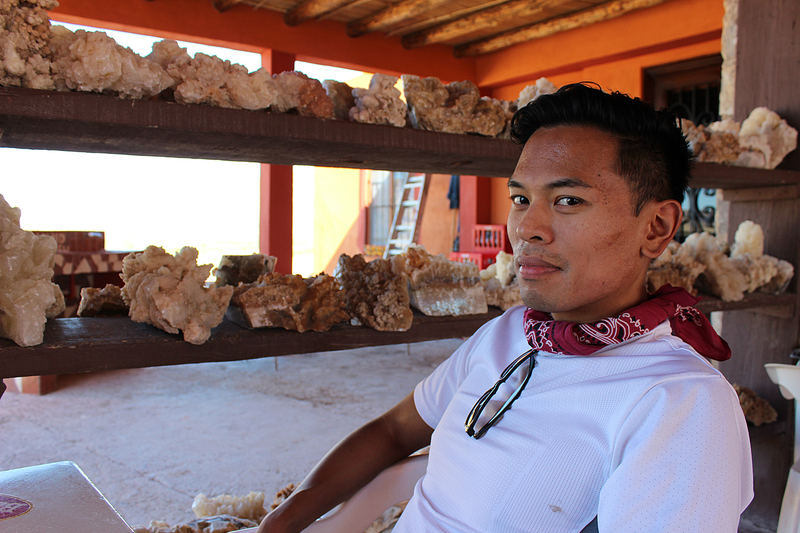 We were told that Herpidio, who looked about 12, would be our guide. 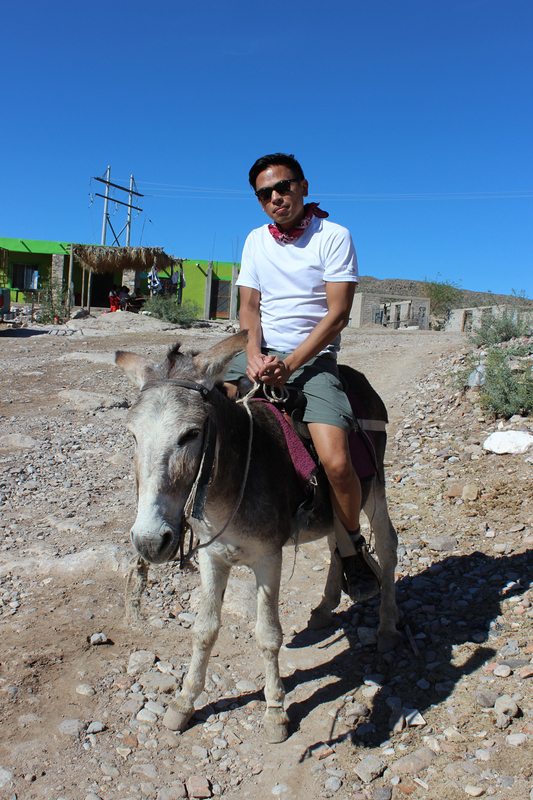 We were helped onto our burros, paid our $5 for the ride, and off we went up the road toward the village. Herpidio followed behind to prod the burros. 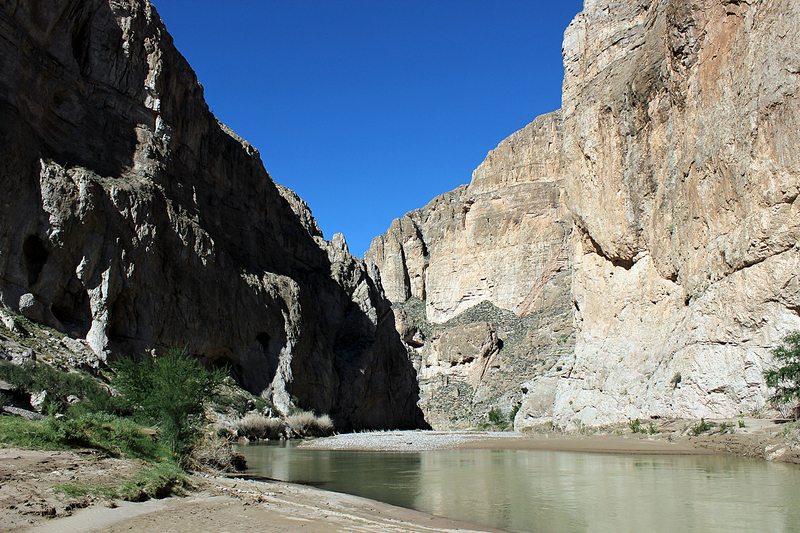 The border at Big Bend National Park had been fairly fluid for decades. 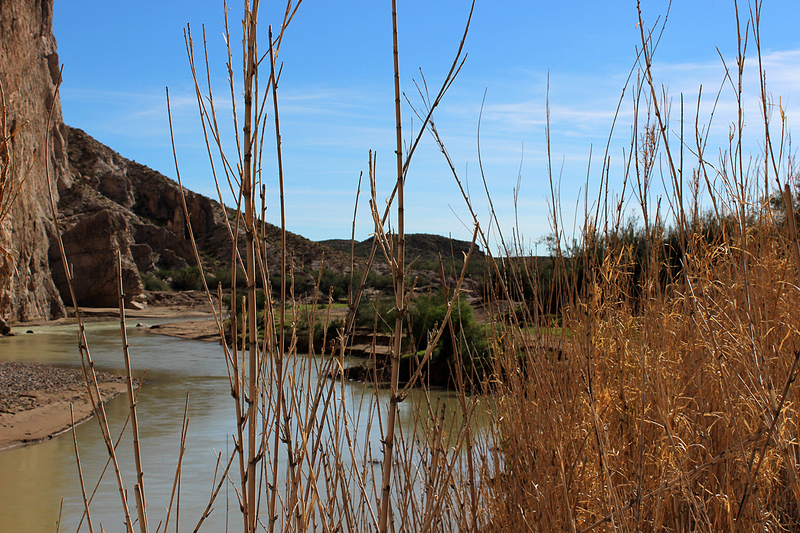 There wasn’t much concern about serious undocumented crossings in part because of the huge distances across the Chihuahuan Desert to the nearest big towns on either side of the border. 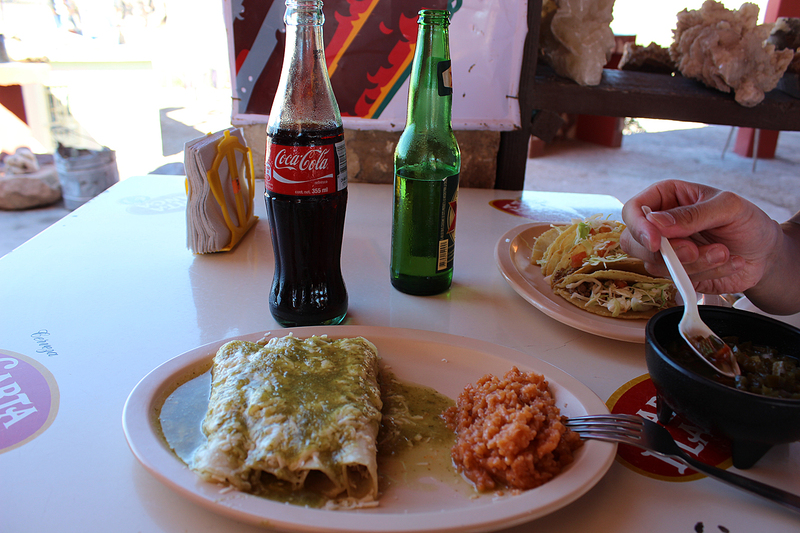 Mexican nationals would cross to get some groceries and whatnot at the campground stores since it was more convenient. Then, after September 11 and the creation of the Department of Homeland Security, the border was closed. 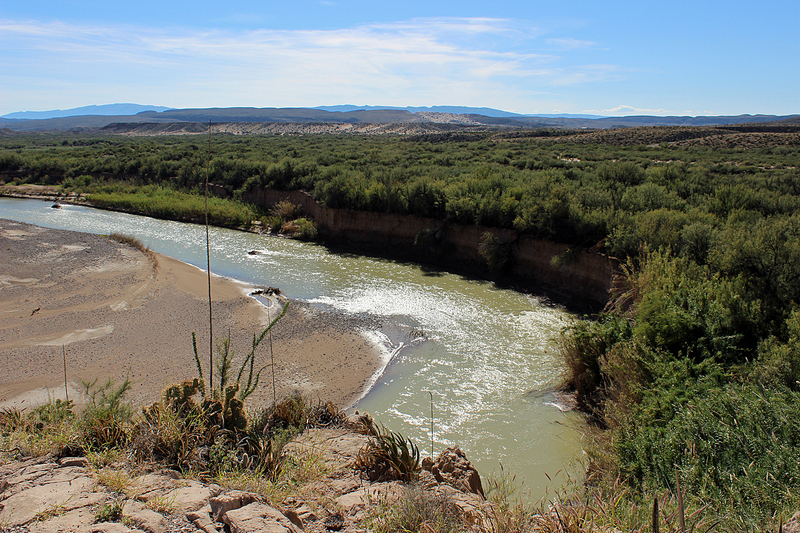 The Park Service worked with Mexican officials for years to create a procedure to reopen the crossing, which finally happened in April of this year. 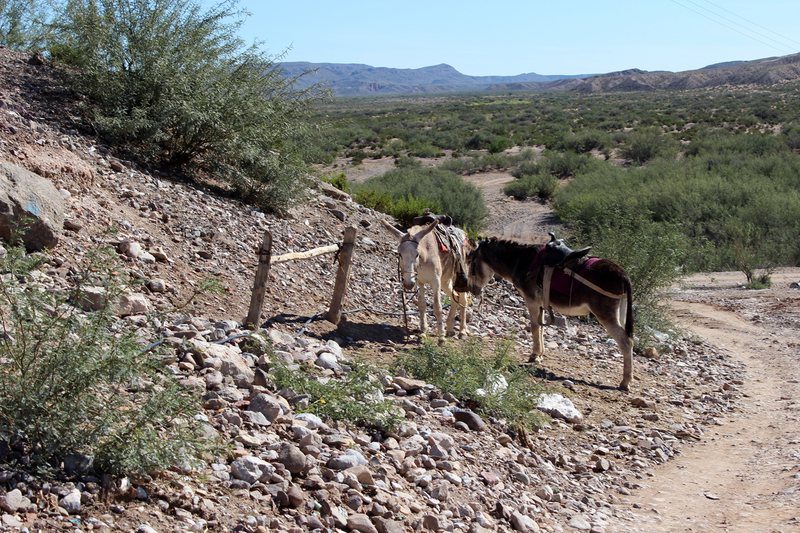 The road crossed a muddy wash, and the burros carried us up a hill and into town. 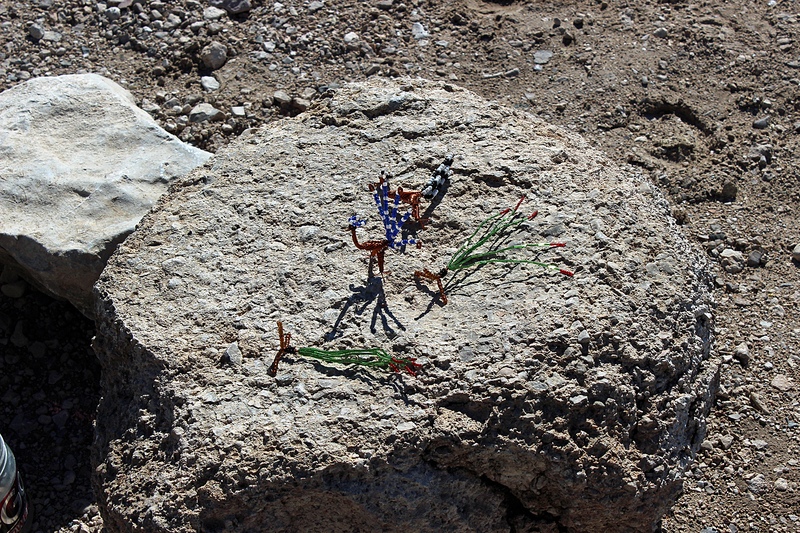 Brightly-colored homes, many with chickens in the yard and handicrafts on display, lined the dirt road. 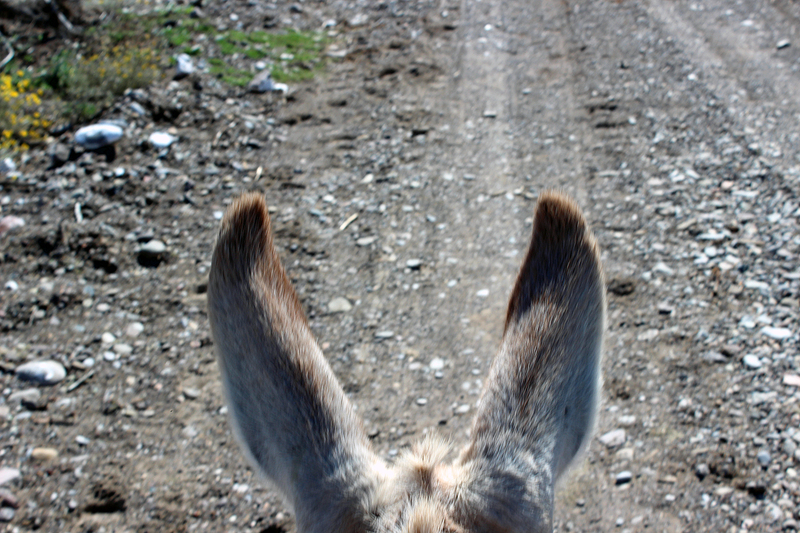 Herpidio tied the mules to a post, and led us to the trailer that housed the customs official. The officer stamped our passports and issued us one-week tourist visas. When we emerged, Herpidio was on the roof of the gas station retrieving an errant soccer ball. He climbed down and asked us if we wanted to go to a restaurant or do some shopping. We said we wanted lunch, so he led us across the street to an open-air restaurant. Once we were settled, he ran off to play soccer. We ordered tacos and enchiladas. 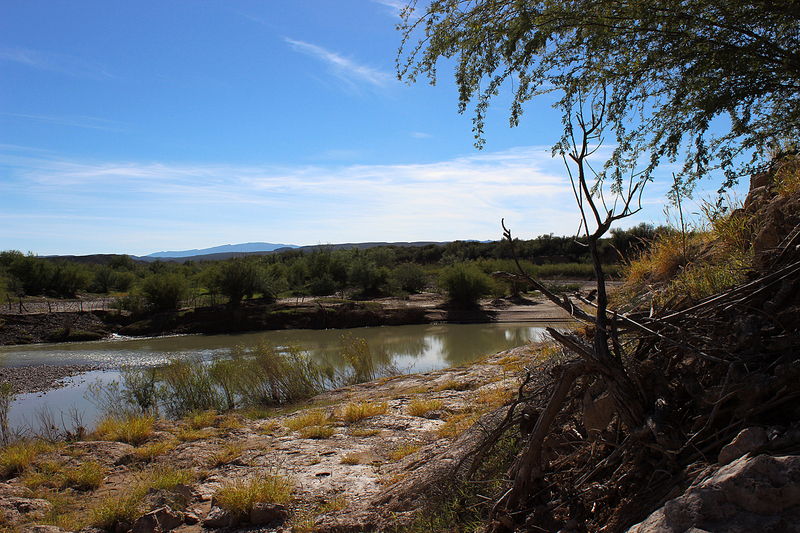 While we waited for our food, we enjoyed a vista across the river to the Chisos in the distance. Other American tourists were lunching at other tables or shopping in the gift shop. When lunch arrived, it was delicious, particularly Sean’s tacos. 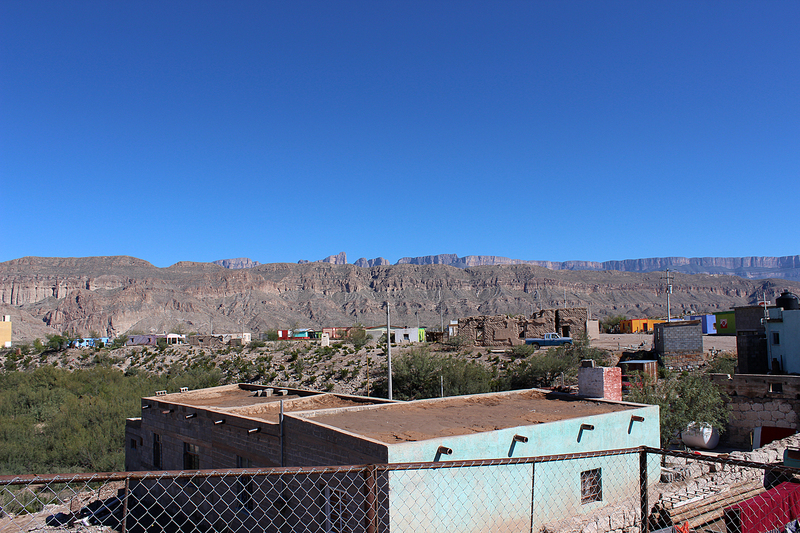 The Chisos visible in the distance from Boquillas. The village, which had originally been founded in the late nineteenth century as a mining town, appeared to be on the verge of something of a rebirth now that the crossing was reopened. 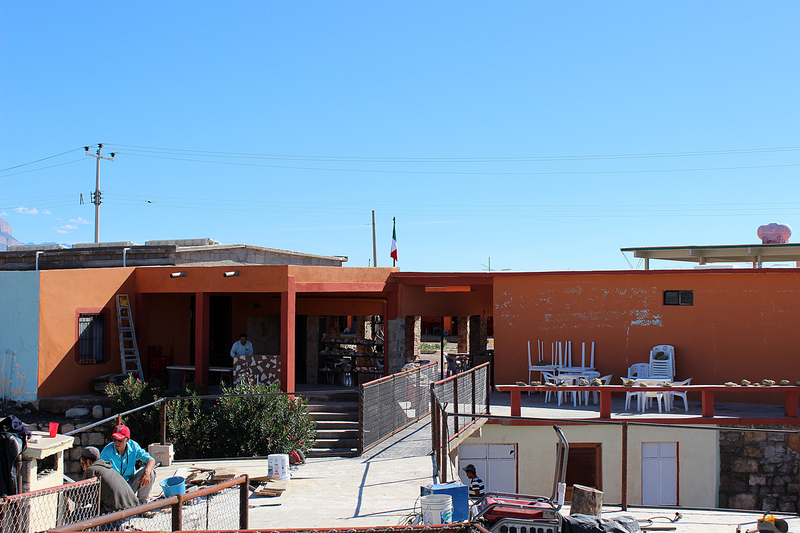 The restaurant was constructing a promenade to show off the views above a cozy-looking guest room. After lunch, we told Herpidio that we were ready to go back. So we returned to the customs trailer, turned in our visas, and had our passports stamped. 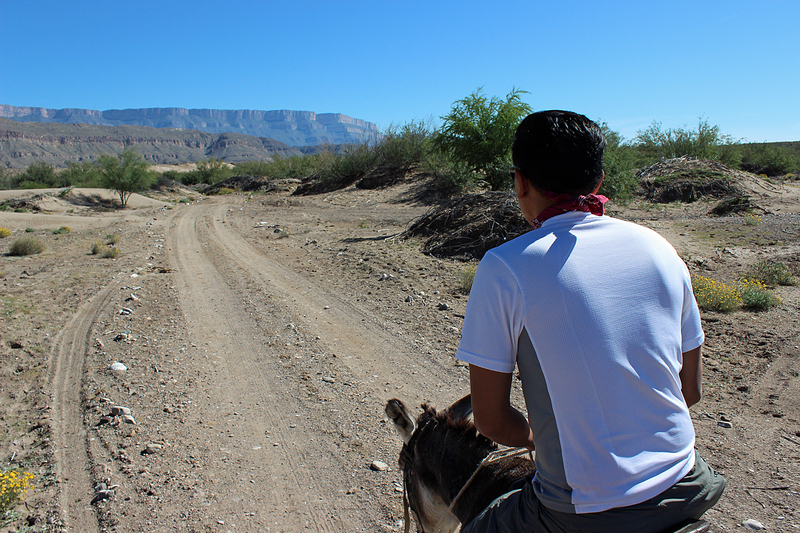 Then Herpidio helped us back onto our waiting burros, and we started off down the road. Back at the river, we tipped Herpidio and signed the guest book before boarding the rowboat and crossing back to the United States. 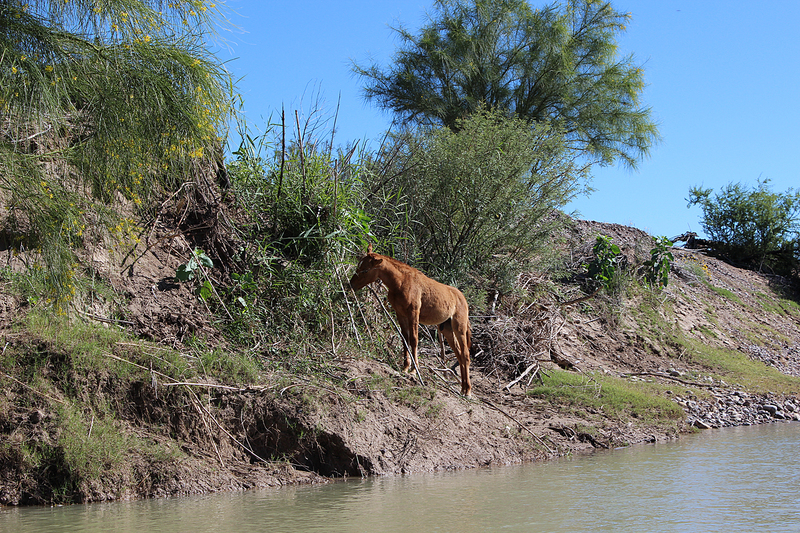 A colt from the herd of horses waiting near the river. 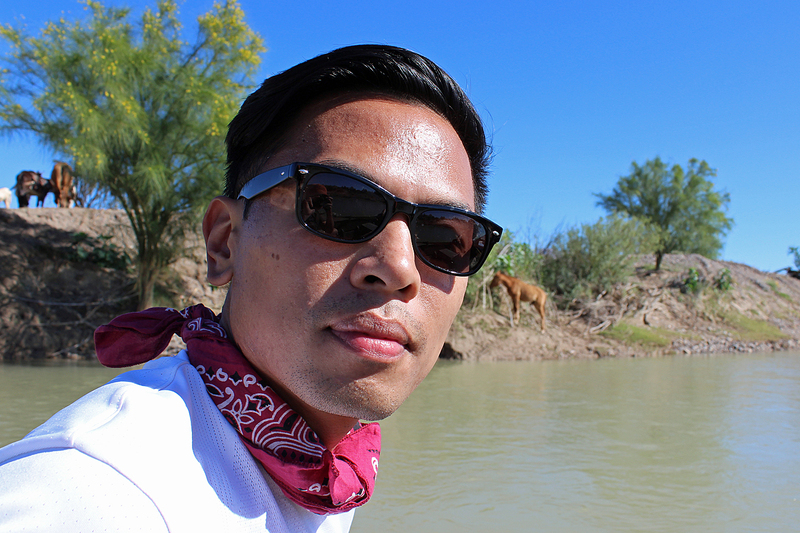 Sean Santos crosses the Rio Grande. 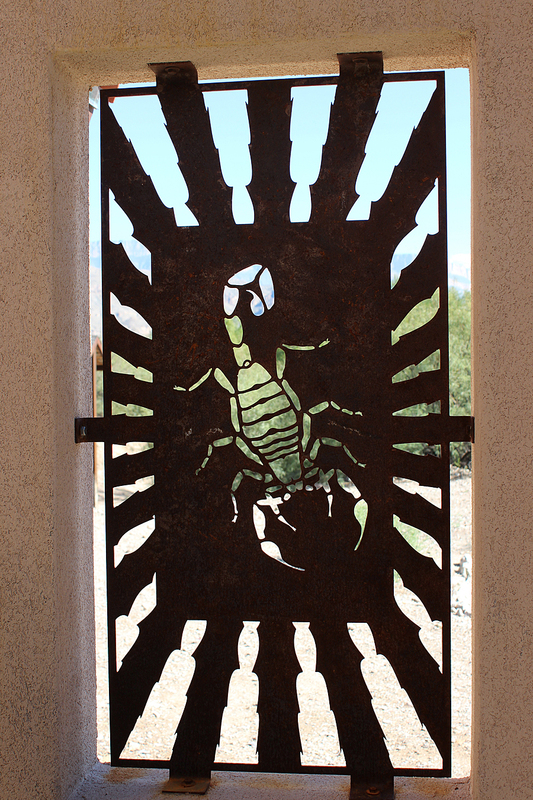 The port of entry building is decorated with a motif of native wildlife. We went through customs at machines that looked like ATMs. We scanned our passports and made our declarations on phone receivers to customs agents located in El Paso. 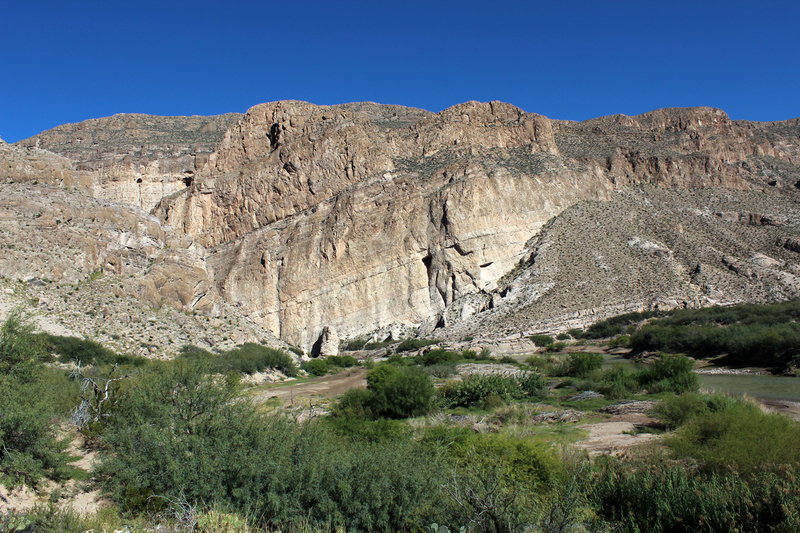 Then we were back in the car and headed a couple miles further east to the parking area for Boquillas Canyon Trail, a 1.4-mile out-and-back into the mouth of Boquillas Canyon. 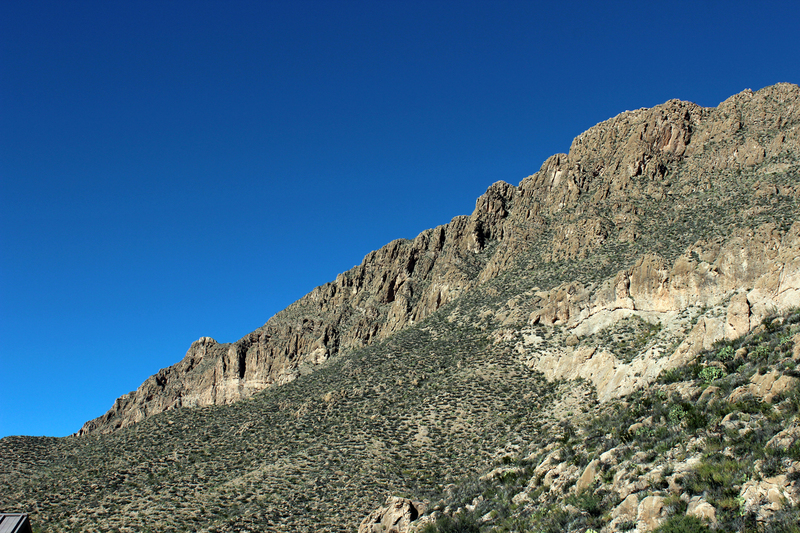 The canyon cuts through the long north-south spine of the Sierra del Carmen mountains and is the easternmost of the three main canyons carved by the Rio Grande at the southern border of the park. 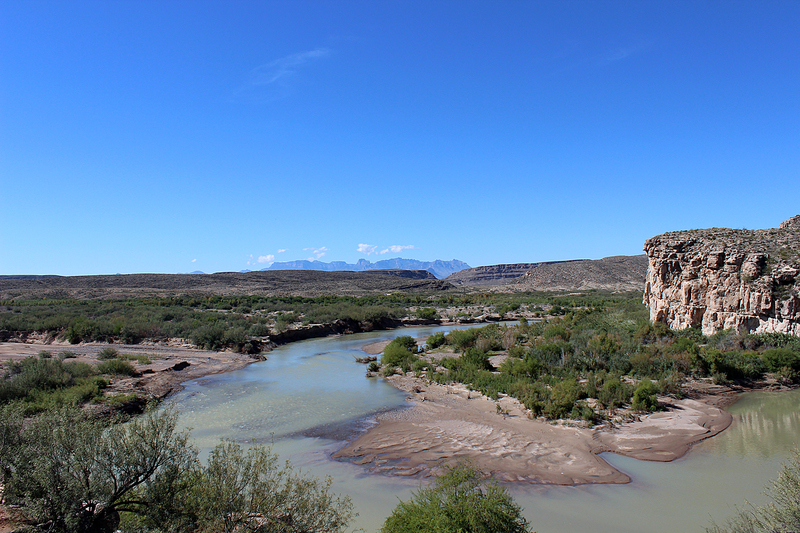 Santa Elena Canyon, which we’d visited that morning, and the remote Mariscal Canyon are the others. 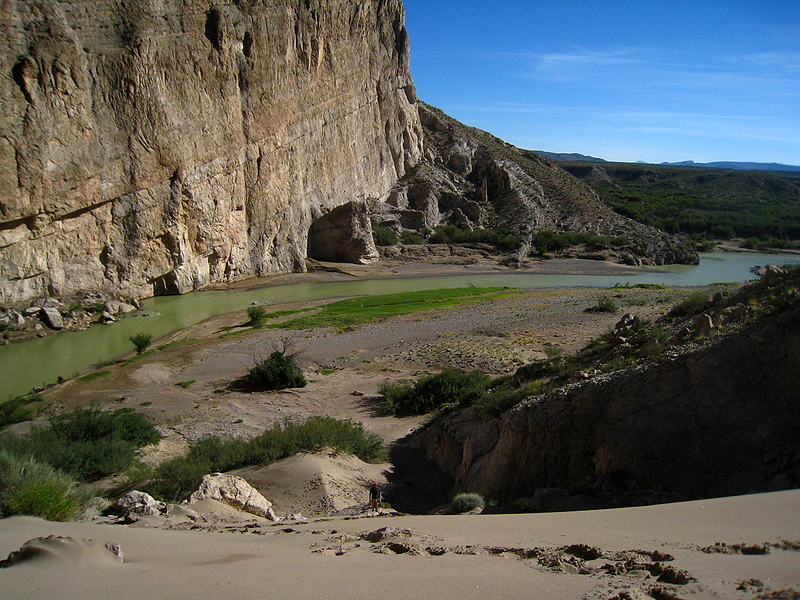 Like at Santa Elena canyon, the trail leads up a series of gentle switchbacks before descending again to the river’s floodplain. 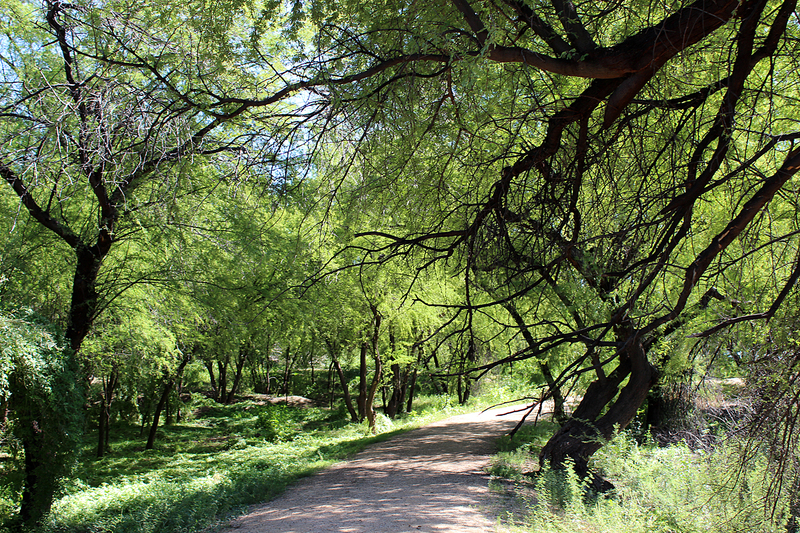 There had been signage in the campgrounds and at the trailheads warning against purchasing anything, even small handicrafts, from any Mexican nationals on the US side of the river. 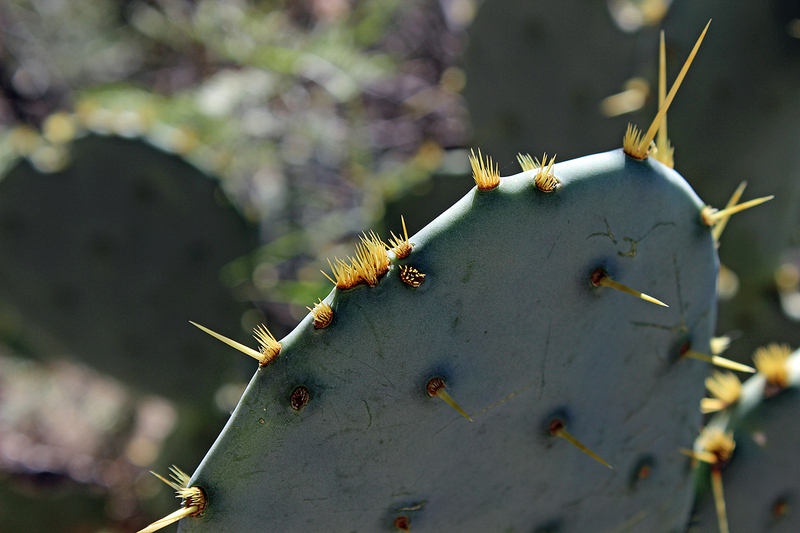 Sure enough, we saw displays of some of the same tiny bead scorpions and ocotillos and roadrunners that we’d been offered in Boquillas. They were accompanied by jars for money and little signs indicating the cost of each. Down at the broad floodplain, we passed other hikers and a group making a run down the river who had stopped for a late lunch or early supper. 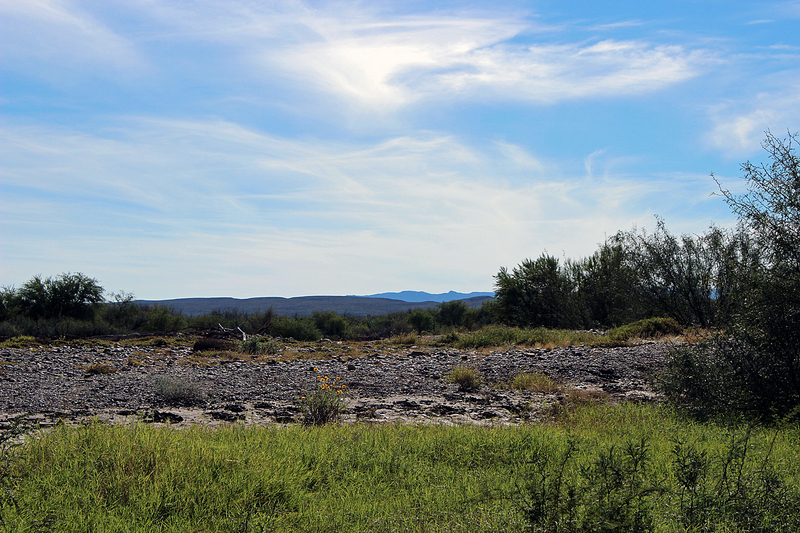 The arid Sierra del Caballo Muerto (Dead Horse Mountains) rise above the river’s grassy floodplain on the US side. 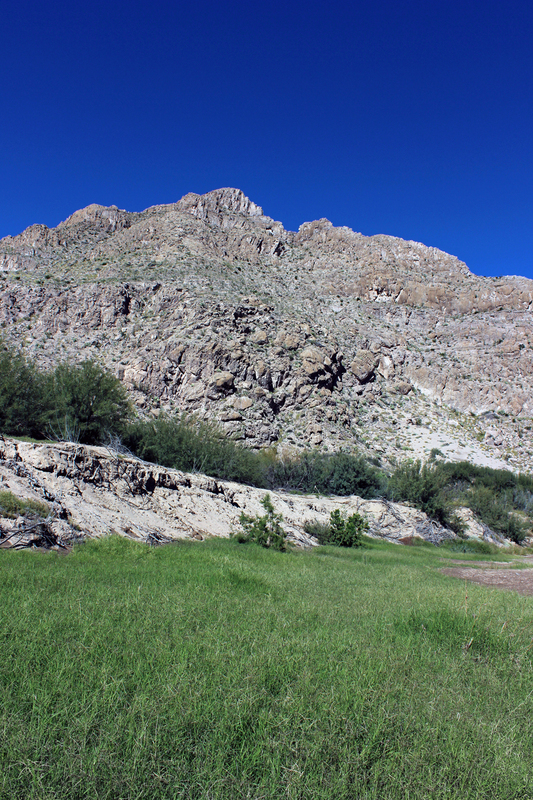 The mountains are the American section of the Sierra del Carmen. 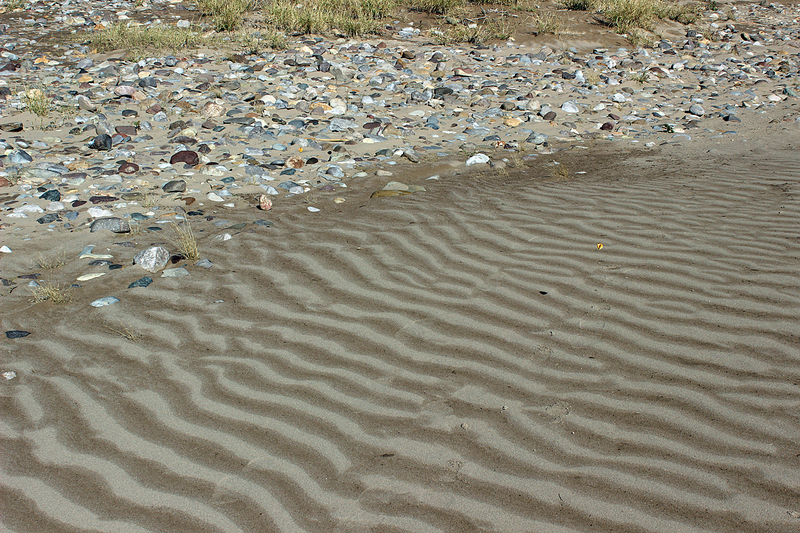 Freshly deposited sand, still damp, was a sign of the recent rain the park had received. 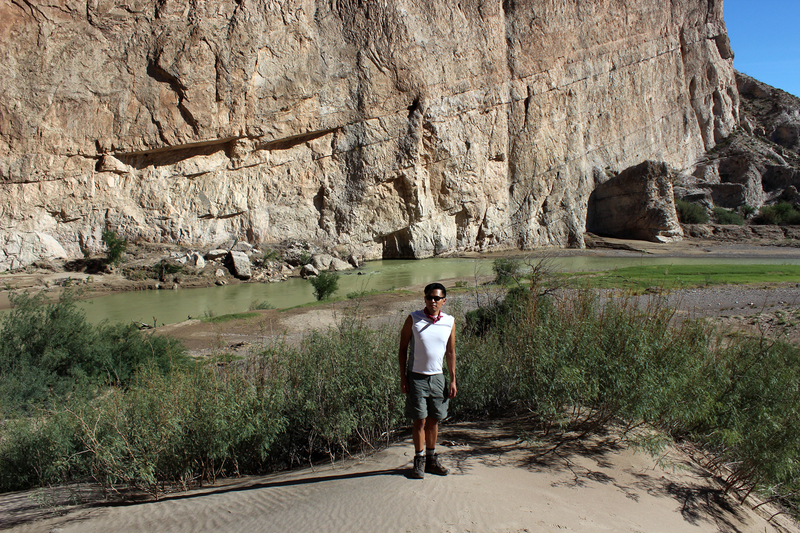 Boquillas Canyon, the US is to the left, Mexico is to the right. 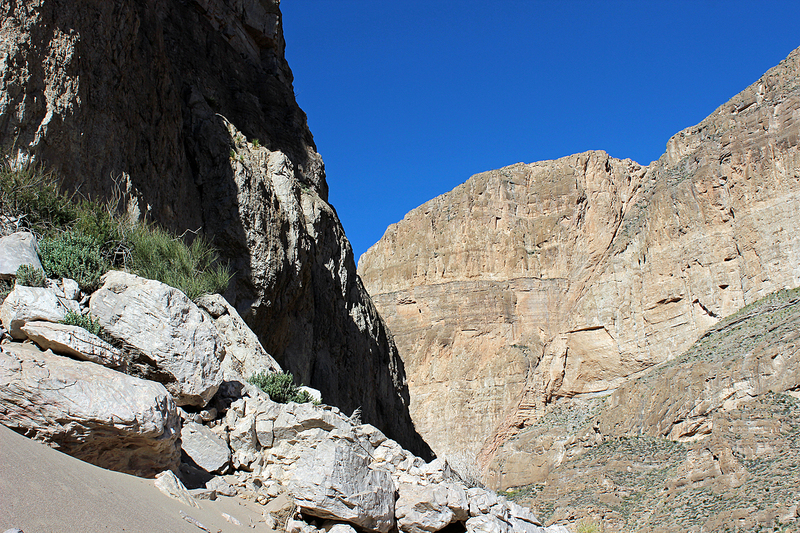 The walls of Boquillas Canyon are less dramatically sheer than Santa Elena canyon, although the rock that forms the Sierra del Carmen is the same as that which forms Mesa de Anguila and the Sierra Ponce of that canyon. 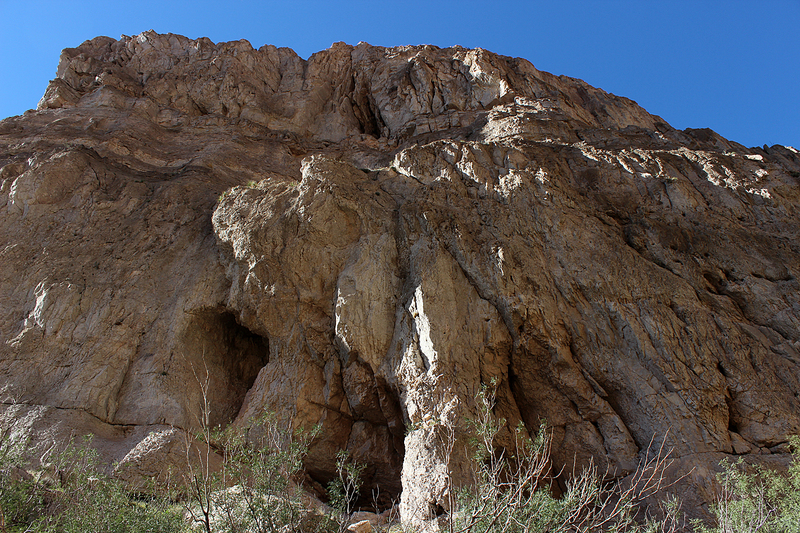 One theory is that the canyon was named Boquillas, which means mouths, due to the caves in its walls. After the trail dead-ended when the river and the canyon walls came so close together that it was impassable, we turned around and headed back. 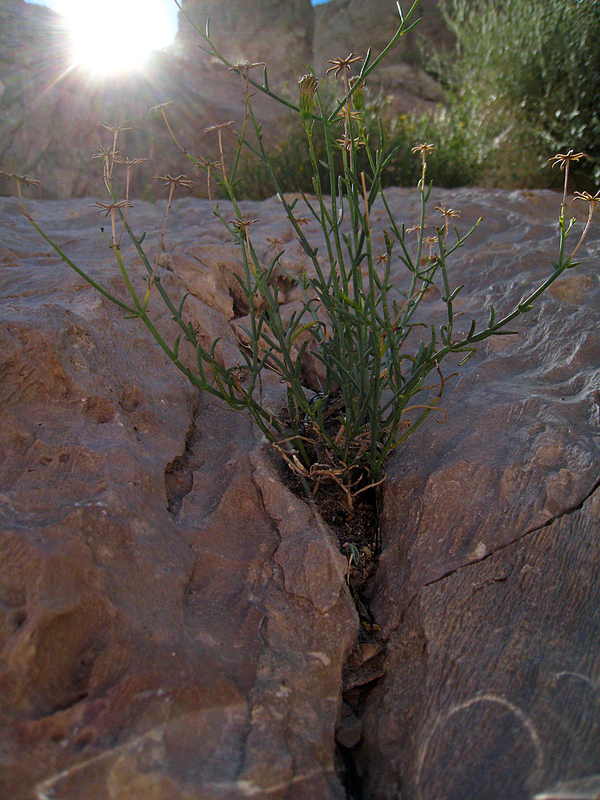 On the way we took a brief detour to climb a huge sand dune pressed up against the canyon’s south wall. 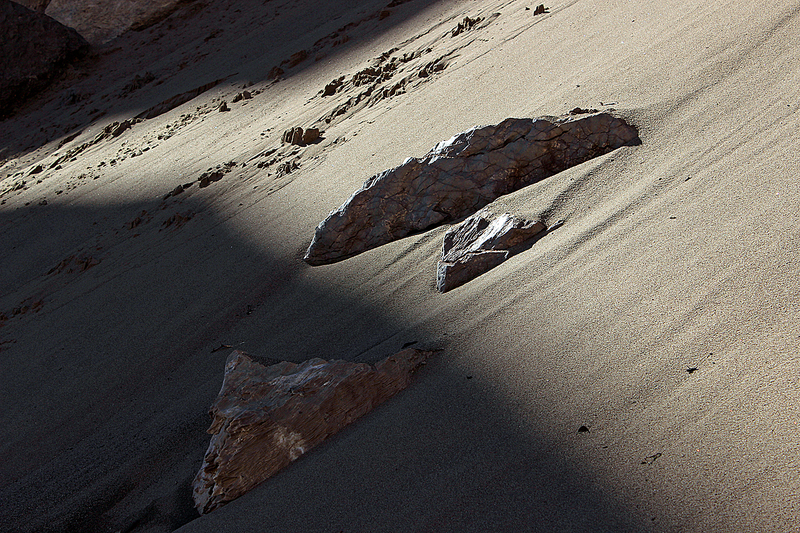 Sean made it to the top of the dune, and took the image below. It was tricky for him to get back down, though, since the recently wet sand was hard packed. 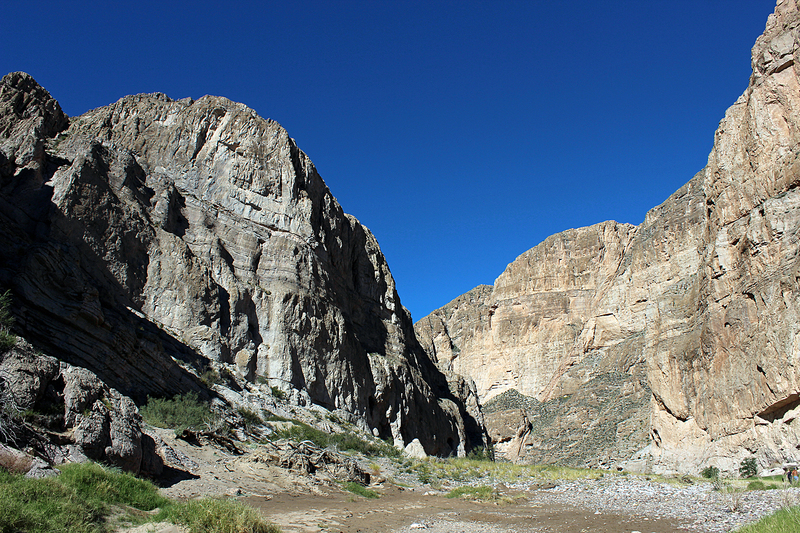 The short hike into Boquillas Canyon is popular, and on our way back to the trailhead we passed more hikers, and even a young man on horseback checking on the handicrafts he’d brought from the other side of the river. We didn’t linger since the afternoon of our first full day in the park was more than half over, and there was still much to see and do. 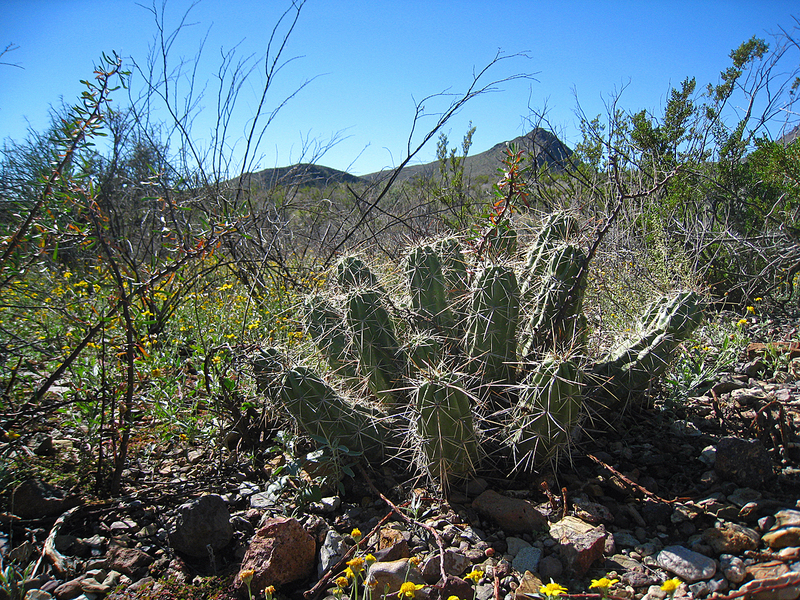 This entry was posted in Journey and tagged Big Bend, Day Hike, Texas on December 16, 2013 by Brandon Hayes.